I've been strapped up by someone on this forum ! Thread: I've been strapped up by someone on this forum ! Speaking with Roy (Spotty Dog) last year at one of our Beer & Natter sessions he mentioned that he’d bought into a company which produced straps and webbing for various applications. Long story short they had some good products but needed a bit of help in terms of direction so he got involved. 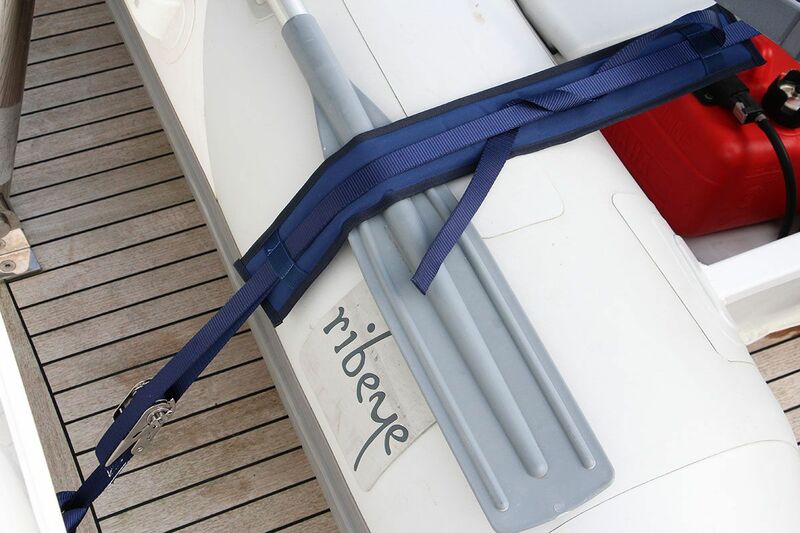 One of the products which interested me was their range of dinghy / tender lifting straps which clip into the passarelle. When we changed the boat a couple of years ago we got a larger tender more suited to chartering where a little more capacity was required. I cobbled together some straps using what was available in the Swanwick Chandlery, it has worked, nobody has died but after a couple of seasons it all looks a bit scruffy and in the back of my mind was always the question of what if something snapped and I had to repair the bathing platform or worse. We have a relatively light tender / engine set up but even so…. This weekend I finally bit the bullet and the old adage of pain of price being quickly replaced by appreciation of quality was immediate. 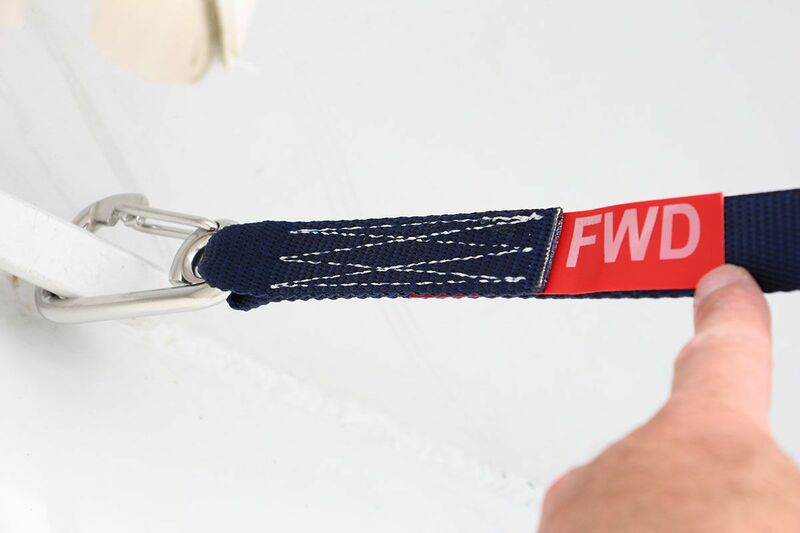 Something as simple as some straps had been really well designed. Adjusting everything to fit the tender was easy although I still can’t quite see how it gets longer or shorter, there are no loose ends ! I also got a couple of tie down straps, one of which in provides a particularly neat solution to a problem we had using the standard mounting points. 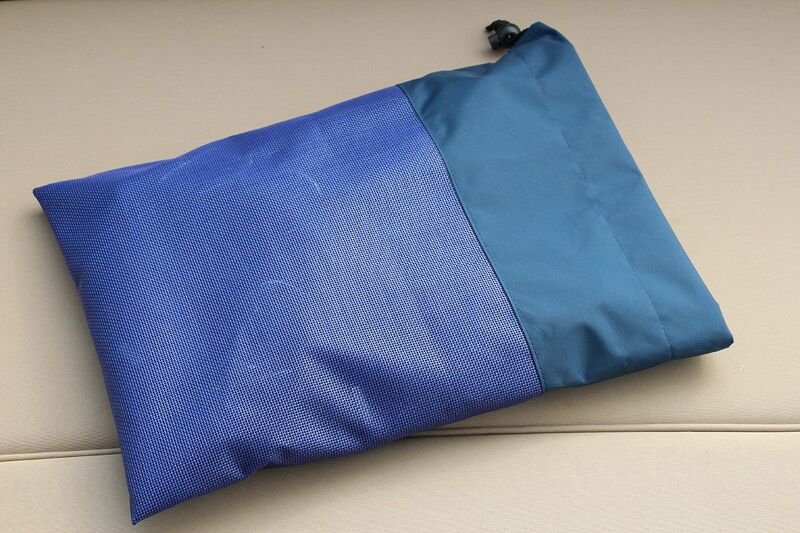 Everything came in very smart wash through net bags which makes rinsing off easy. No connection with the company other than knowing Roy through the forum but as a very happy customer I wanted to openly thank him for his advice and ultimately the product. edited to say I haven't actually got an overall shot showing the tender supported from the passerelle, I will sort one out at some stage. I used some old 10mm 3 strand rope, took about half an hour to splice some loops into each end at the required length. 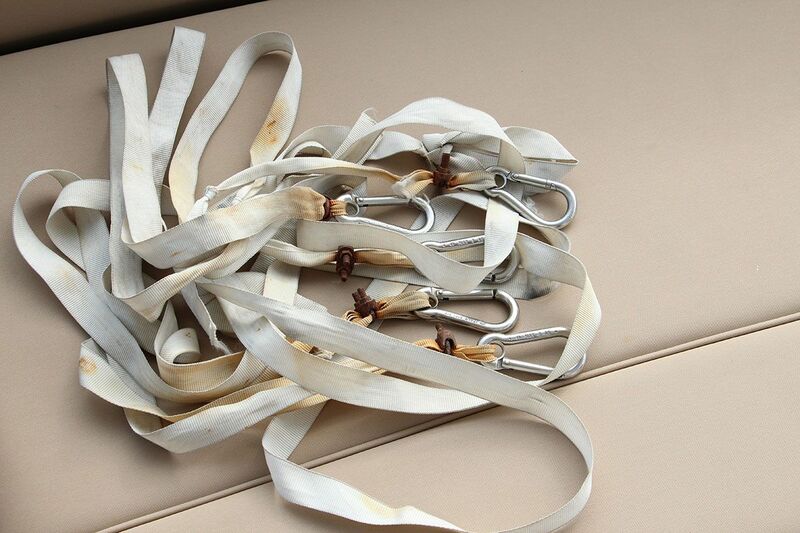 The rope is rated to 2500 kg, so no worries on loading. 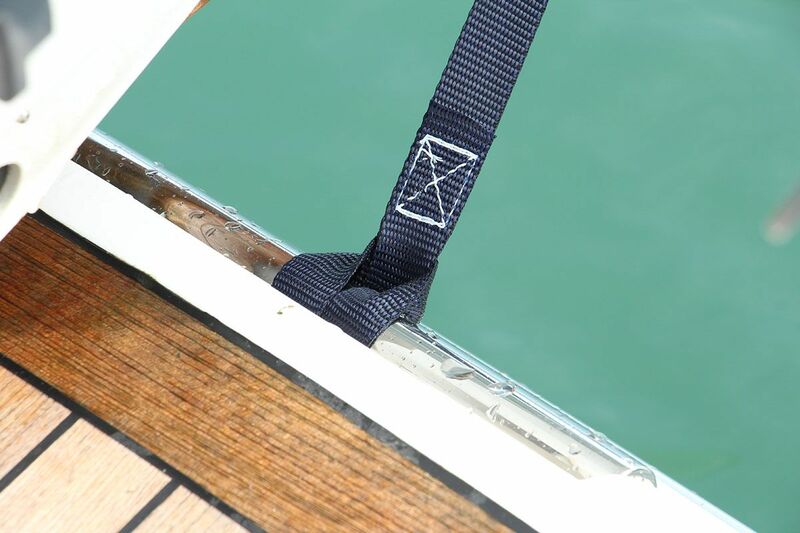 Actually I prefer the rope as it has a little give in it, so less shock load on the fixings when it's choppy. 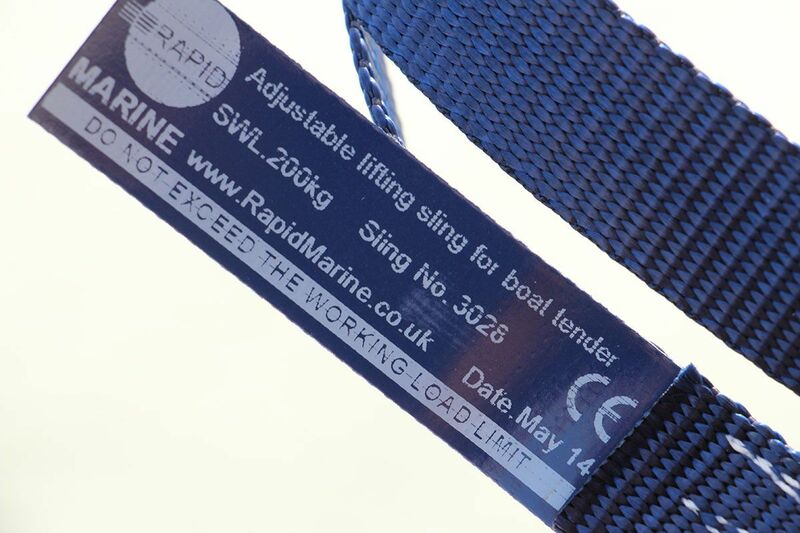 The Rapid Marine product does look top notch though. Henry, thanks for the great write up, most appreciated. Btw, can we have your old ones for our rogues gallery ? We have been using these products for sometime now, and can confirm they are top quality , they still look and function as when they were when new, no fading or rust , unlike the cheaper ones, we had the stainless steel plastic coated strops before, problem with them, when you change your tender you end up having to have new strops as you can be sure they won't fit, unlike the Rapid marine ones that are fully adjustable , ( we are on our forth tender in five years ) so they have saved us a lot more than they cost ,just to add that they were also a lot cheaper than the stainless steel ones we had . First class products, first class quality, first class service. Would not go anywhere else for such products. I haven't actually got an overall shot showing the tender supported from the passerelle, I will sort one out at some stage. 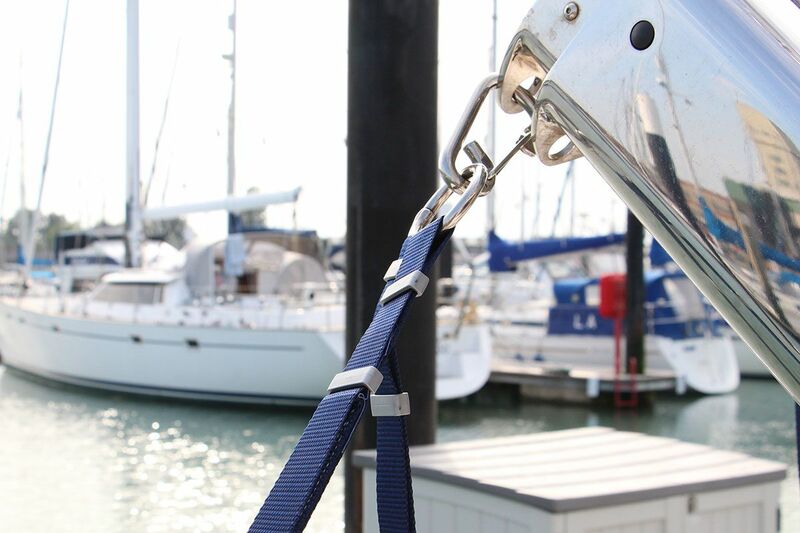 These straps really do look like good quality but I'm not so sure about the choice of snap shackles in the top picture for hoisting (although I'm sure there's plenty left lifting a small rib) and also the transom mounting in the lower picture for tie down. Weakest link comes to mind, does this part of the transom have backing reinforcement behind this mounting? 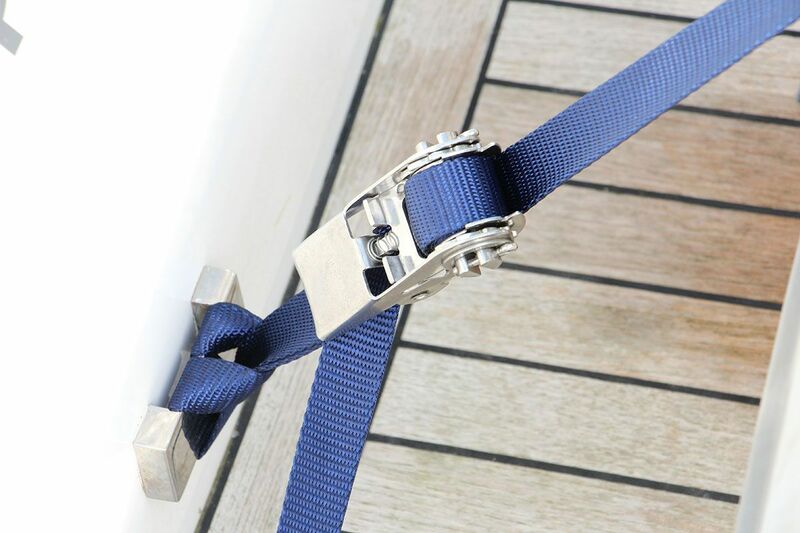 Tie downs have to take the largest shock load if a big wave hits the dinghy while at sea. Hoisting on the passerelle is the lightweight issue and can easily be done with 10-12mm 3 ply ropes as NickH and I did. Don't forget these ropes are often stronger that the shackles connecting them. If you're passing say Hi. It's probably Schnapps o'clock. Thanks for the positive comments Roger, just for information the top snap hook is 10mm, when tested it failed" at 1600 kgs loading. By all means have the old straps as a reference. At least they were genuinely what was replaced. Or were you wanting to reverse engineer my solution ? Thanks for clarifying, there was nothing to scale them in the pics. 10mm and 1600 Kgs is massive. I'm just worried about the passerelle now! Usually only rated to 250-300 Kgs. Me too, in case HenryF tries "man riding" . This the term used when we have to quote for slings for vessels ready maned.